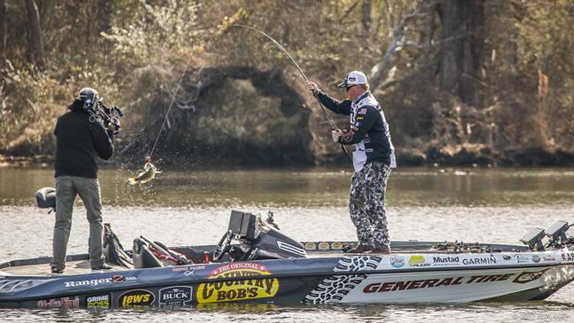 Mark Rose is seeking his first career FLW win at Lake Guntersville. Mark Rose doesn’t care who wins the Super Bowl on Sunday. He’s more focused on his own Big Game. The Tennessee River ace has won at Pickwick Lake before. He’s won at Lake Chickamauga, too. A victory at Lake Guntersville, considered by many the crown jewel of the TVA system, has been elusive, though. He took 2nd there in the 2010 FLW Tour and again in the 2014 Southeastern FLW Series. He’s hoping to change that tomorrow. 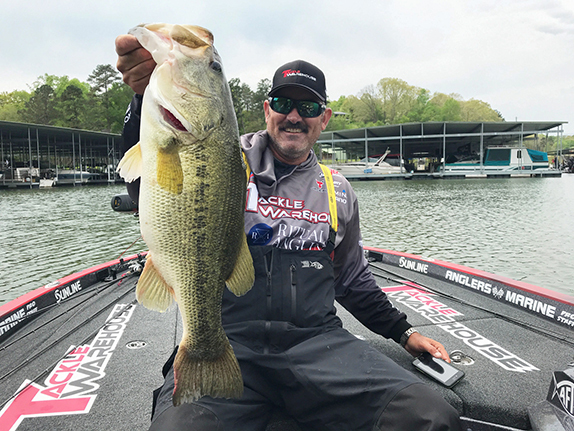 Rose failed to crack the 20-pound mark Saturday, but his 19-00 stringer kept him in the lead entering the final day of the season opener with a 61-08 total. Bryan Thrift held onto 2nd with a 17-04 bag that gave him 56-12. 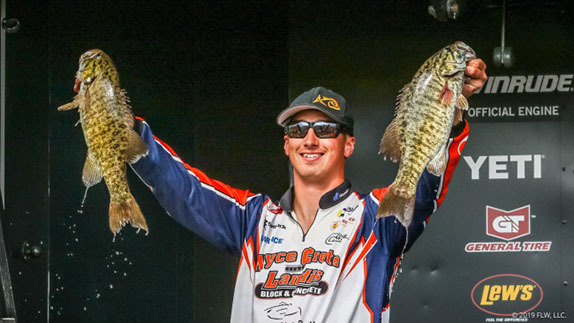 While Rose and Thrift have seen their bags get progressively smaller, local resident and Guntersville guide Alex Davis made a move up to 3rd with the day’s biggest stringer, a 20-02 limit that boosted his total to 54-06. 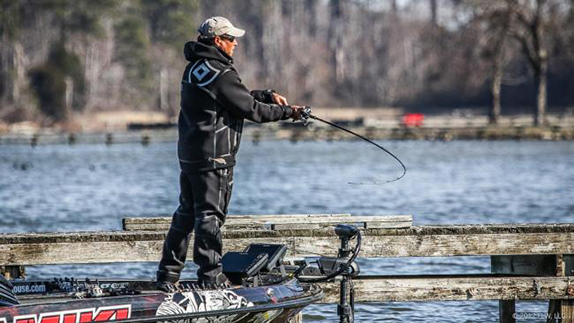 Scott Suggs advanced six spots to 4th behind a 17-14 stringer to push his total to 51-11. Shinichi Fukae remained in 5th, thanks to a 16-11 bag that gave him 51-05. Christopher Brasher and Brandon Cobb each made 10-spot jumps into the Top 10 today with Brasher catching 19-03 to go from 16th to 6th and Cobb bagging 18-05 to move up from 19th to 9th. Chris McCall caught 13-08 and jumped two slots to 10th. Barry Wilson tumbled to 17th from 3rd after sacking just one fish today. Randy Blaukat (6th to 14th) and Jason Reyes (8th to 13th) also slipped out of the Top 10. While Guntersville’s bass continue to be locked in their winter pattern, the lake still harbors a healthy population of 5- to 7-pounders, but those bites have been mostly elusive this week. One or two of those tomorrow could certainly swing the outcome. The sun made an extended appearance today, but overcast skies with a slight breeze out of the southwest along with temperatures reaching the mid 50s are what’s in store for the final day. Counting this week, Rose has logged a Top-10 finish in 19 of the 41 multi-day FLW tournaments he’s competed in on the Tennessee River. That’s an impressive 46-percent rate. He hit roughly 10 spots today, some he’d fished earlier in the tournament, some he hadn’t. He tallied eight keepers on a trio of baits – a Strike King jig, a Strike King Flate Side crankbait and a vibrating jig. He’ll let the weather and conditions Sunday dictate what he throws and where. 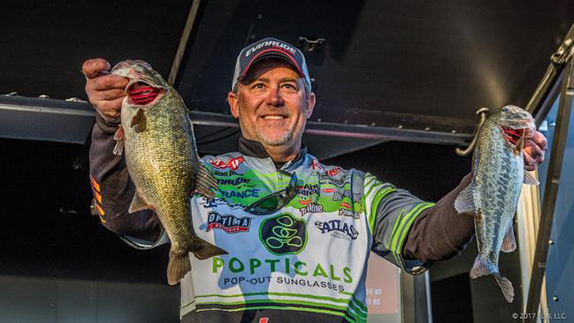 Bryan Thrift will be chasing his fifth career FLW Tour victory tomorrow. The only thing that changed today for Thrift was he was able to catch a fish on a jig. Other than that, it was status quo for the man known for running and gunning in all different directions over the course of a day. He had four keepers in the boat by 8:30 this morning, all from an area that produced 10 bites for him on Friday. After that, the activity slowed down and it took him until 11 a.m. to finish his limit elsewhere. He culled once the rest of the day. “I think it’s getting a little tougher or I’ve just caught what’s willing to bite in the areas I’m fishing,” he said. 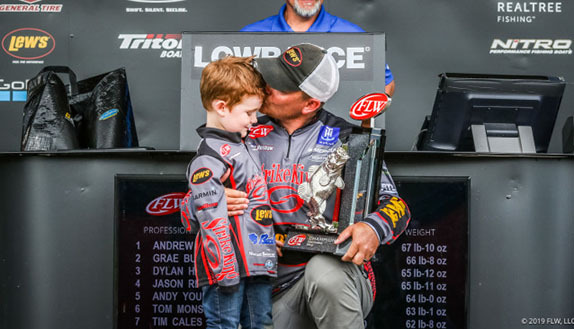 Regardless, he’s thrilled to get the season started with a strong finish after starting last year with a 132nd at Lake Okeechobee. “It definitely feels good to start the year off with a good paycheck,” he added. In order to unseat Rose on Sunday, he thinks he’ll need his biggest bag of the week. He’s just not sure he can pull it off. “The only chance I have to win is to catch a couple giants and get to the mid-20s because Mark will catch 19 or 20,” he said. “I feel like I need mid 20s to have a shot. I don’t know if it’s possible. I have to go practice tomorrow because my stuff is about dried up. 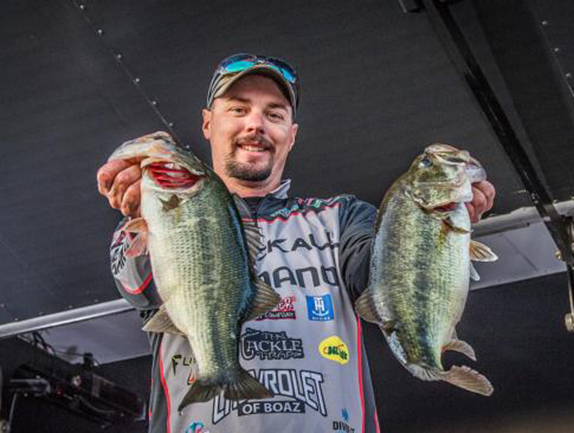 Alex Davis is looking to add a Tour win to his impressive Guntersville résume on Sunday. In Suggs’ estimation, had the cold front not come through this week, the weights would’ve been trending upward rather than leveling off. Either way, he’s capitalized on the sunny conditions the last 2 days to climb into the Top 5. After boating six keepers each of the first 2 days, he totaled nine today. Scott Suggs isn't sure how the cloudy conditions Sunday will impact his pattern. For the first 2 days, Fukae’s best spot has been mostly protected from the wind. Today, the wind turned around and his spot was caught in the crosshairs. He still managed to catch four keepers there, but he started to get concerned that the water clarity was going to deteriorate at some point. He eventually moved off of it and finished his limit elsewhere and caught several other upgrades. He’s also going to look at spots with a little deeper water in hopes of catching a couple bigger fish. His best bait this week has been the SPRO Aruku Shad, a lipless crankbait that he replaces the stock hooks with Gamakatsu Aaron Martens TGW Nano Finesse trebles. > Day 3 stats – 20 anglers, 11 limits, 2 fours, 2 threes, 1 two, 3 ones, 1 zero.